This strange spring flower first becomes apparent in January, when its narrow green spikes emerge from the ground. Inside each spike is an unusual flower stem, bearing a purple flower. In fact this is a compound flower, with the male part positioned above the female. The distinctive purple-spotted leaves and purple-tinged hood of Arum maculatum appear early in the year, often in March or April. The hood eventually opens to reveal a complex purplish spadix that looks rather like a fireworks sparkler, comprising a long club above a narrower stem. The female flowers develop at the bottom of the spadix, with an annulus of male flowers positioned immediately above them. By mid summer the female flower has produced a cluster of green berries that ripen and turn orange-red as the leaves and the hood decay. Stems laden with berries persist through the autumn and into winter, and by the end of the year fallen berry-laden stems are all there is to mark the site where, in a month or two, the new leaves and then flowers will emerge. Common throughout Britain and Ireland, this unusual wildflower is found throughout most of mainland Europe and in parts of western Asia. The flowers of Lords and Ladies open in April and May, and then the hood decays leaving a stem on which berries develop and ripen in the autumn. 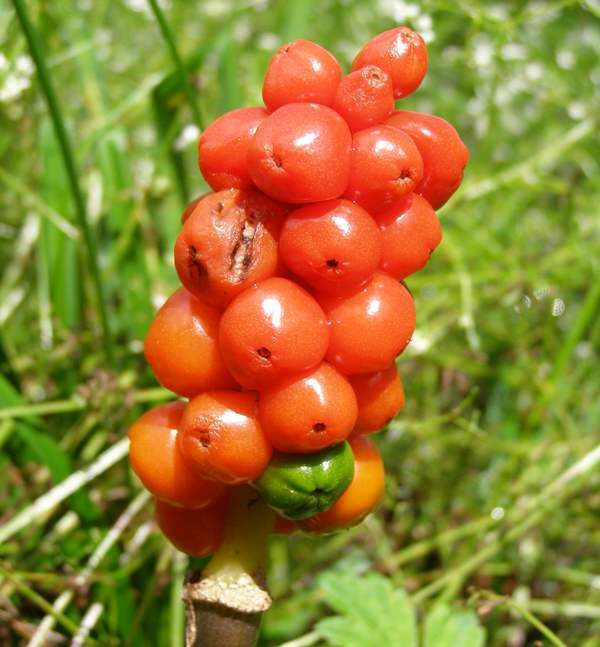 Roasted roots of Arum maculatum were used to produce a kind of drink; however, without proper preparation the resulting beverage can be toxic. There is also a danger that young children might be tempted to eat the brightly coloured berries (although they are very bitter tasting), with serious consequences because this is such a poisonous plant. The genus name Arum comes from Aron, the Greek name for plants of this type. Maculatum comes from Latin and means spotted, a reference to the spotted leaves of this plant. 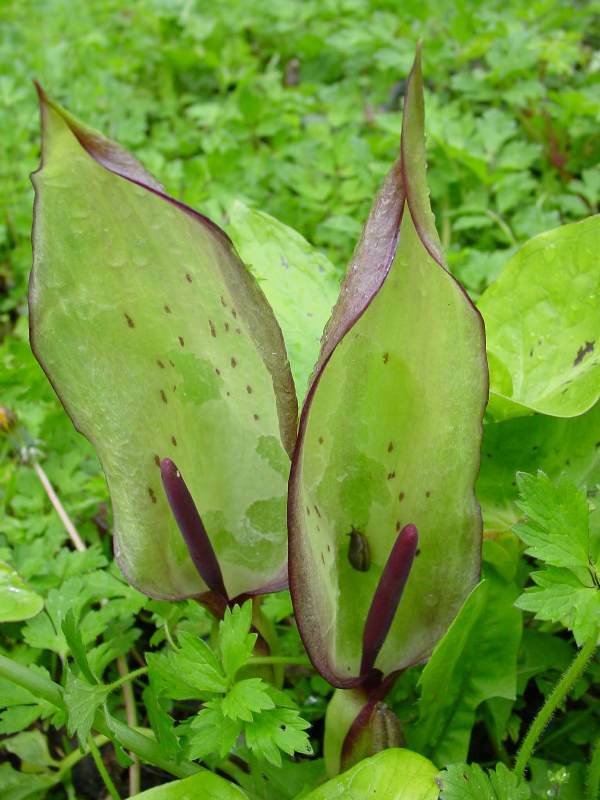 Other common names for this species include Cuckoo-pint and Jack-in-the-pulpit. 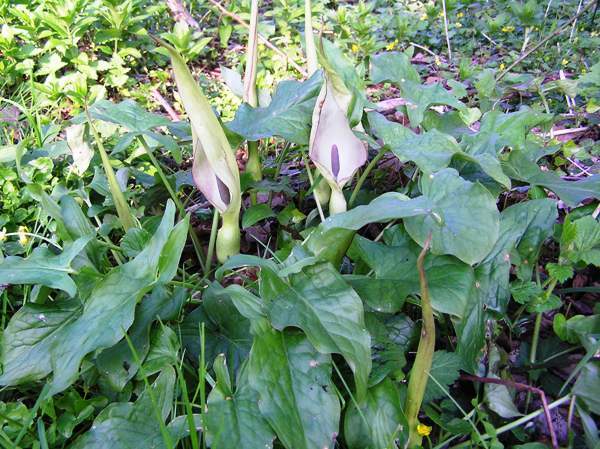 The pictures of Arum maculatum shown on this page were taken in South Wales, UK.